November 28, 2017 (Ramallah, Occupied Palestine) — Today, two of the most prominent Palestinian Christian networks joined the calls on Pope Francis to refuse Israeli prime minister Benjamin Netanyahu’s invitation to launch the Giro d’Italia in Israel next May. The endorsements come the day before the official race presentation in Milan on November 29, coinciding with the United Nation’s International Day of Solidarity with the Palestinian People. 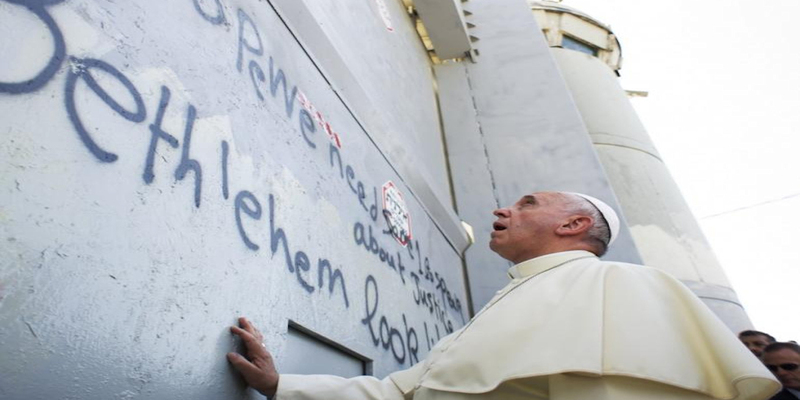 The letter also recalls the Pope’s call for a “commitment to ensure that sport is always more inclusive and that its benefits are truly accessible to all.” The signatories note that “Israel repeatedly violates this principle” by bombing and destroying Palestinian sports structures, routinely denying freedom of movement to Palestinian athletes, imprisoning and shooting Palestinian athletes, and killing Palestinian children playing football, on more than one occasion. Netanyahu’s invitation was hand delivered by Sylvan Adams, the Canadian billionaire funding the Israeli cycling team, which is vying for one of four wildcard slots to participate in the Giro d’Italia. Just days before the Giro d’Italia is to take place next year, the Israeli team will participate in a race that goes through occupied East Jerusalem to the illegal settlement of Pisgat Ze’ev. The National Coalition of Christian Organizations in Palestine includes the leading Christian Palestinian organizations in present-day Israel and the Occupied Palestinian Territory, including those in Jerusalem, Bethlehem, and Gaza. About 200,000 Christian Palestinians currently reside in historic Palestine, descendants of some of the oldest Christian communities in the world. As an integral part of the Palestinian people subjected to half a century of Israeli military occupation and nearly 70 years of ongoing dispossession and apartheid, they suffer from widespread official and unofficial Israeli discrimination and hate crimes, whether they are citizens of Israel, live under Israeli military rule or have been rendered refugees denied their right of return to their homeland. The letter to the Pope comes amid heightened calls for the Giro d’Italia start to be moved from Israel. On November 22, more than one hundred twenty human rights organizations, trade unions, ethical tourism associations, sports and faith-based groups from over 20 countries issued an international call to move the race start from Israel. The groups were joined by renowned linguist Noam Chomsky, prominent jurists former United Nations Special Rapporteurs on Palestinian rights John Dugard and Richard Falk, Italian playwright Moni Ovadia, European Parliament members Eleonora Forenza, Curzio Maltese and Sergio Cofferati, and former vice president of European Parliament Luisa Morgantini. Hundreds of cyclists participated in bike rallies throughout Italy over the weekend, calling on Giro d’Italia organizers to move the race start from Israel.